“What is all over my floors?” A question quite often asked during the months of December thru April in Massachusetts. What were once shiny clean and streak-free floors, have succumbed to stained, spotted, and messy surfaces. Nailing down what initially created this disaster can help alleviate them back to life. Floors are important to upkeep during the long winter months of cold, slushy, snowy weather. The task may seem challenging, but as long as they’re being cared for on a steady basis, they should appear and remain clean. Typically the melted mess on the floors are a result of customers and employees tracking wet footprints into your facility. 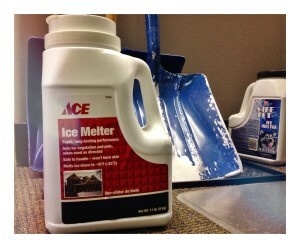 Rock salt, ice/snow melt, and sand are two products most commonly used to prevent icy outdoor grounds. What’s found in the melting products are salt compounds which contain sodium, magnesium, potassium, and calcium chloride chemicals. These chemicals are great for keeping pedestrians safe outside; However, not so spectacular for offices’ carpeted and hard floors. The first step to preventing the wintery mixture from spreading into a facility is to place floor mats in the entranceway or front foyer of a facility. These are affordable to purchase and can stop permanent stains from doing serious damage to carpets and floors. Ultimately, it will hinder having to replace any expensive flooring throughout a facility (which can be very costly!). Floor cleaning is a necessary service during the winter season. Professional floor cleaners typically use an everyday floor cleaner when cleaning regular dirt and grime. However, salty and wintery-stained floors require an acidic neutralized floor cleaning solution due to the high pH qualities of the snow melt and salty products. Lastly, include floor maintenance as part of your cleaning routing; Especially, amidst the brutal wintery months. A professional janitorial service can provide the proper experience and knowledge in caring for offices and facilities’ floors.